flowers for flower lovers. : Adonis flowers. Sweet Vernal is a perennial which grows from south-east Sweden to the south of Europe and eastwards to western Siberia. It is a typical steppe plant, and it doesn't grow in too many places in Europe. Because of loss of habitat and too much of it has been collected for medical purposes, Sweet Vernal is becoming scarce there. More of it is starting to grow in eastern Europe. produce vomiting and diarrhea, however and is only used when digitalis fails. Because Sweet Vernal can't be cultivated, plants have to be collected from the wild, which make them very vulnerable. A rare plant in most of its range, it has legal protection from gathering in most countries. Sweet Vernal is a very beautiful flower. 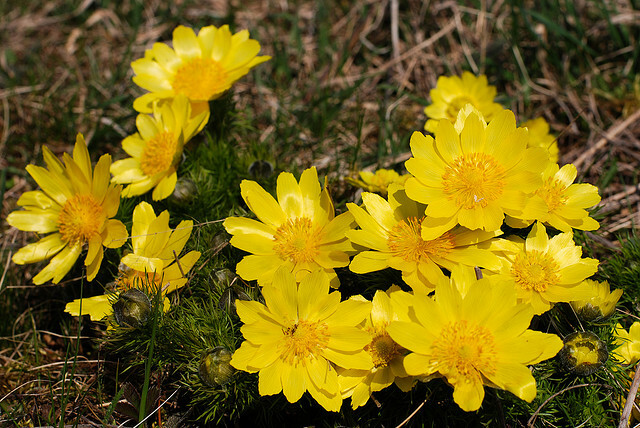 It blooms in early spring and has a rich, golden, buttercup-like glow. Its leaves are like filigree, and very delicate. 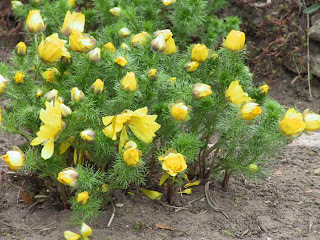 Adonis vernalis is part of the Ranunculaceae family.